Unfinished Solid White Poplar Flying V Bolt On Body. 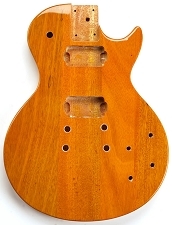 Home > Necks and Bodies > Bolt-On "set Neck" Style necks and Bodies > Unfinished Solid White Poplar Flying V Bolt On Body. Great Vintage style Flying V body cut for all top mount controls and pickups. Even the output jack mounts to the pickguard. The neck pocket is the now-standard 57mm LP style slot, and ANY of our setneck style necks fit- Sure, go ahead and put a LP neck on a Flying V- it's up to you! These are brand new, but we always find a good hand polishing will remove all of the minor scuffs and scrapes a new body can pick up during the shipping process. These are cut from solid White Poplar, a nice medium weight very hard tonewood. 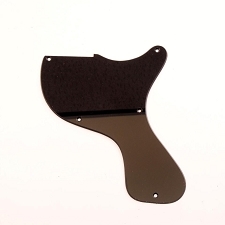 LP rear control covers- Black. 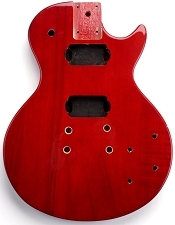 LP Special Body- SOLID Mahogany- Bolt On Vintage Cherry Free Rear Plates! 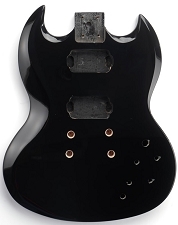 SG Body - SOLID Mahogany- Gloss Black - Bolt On - Free Rear Cover! Dual Pickup. 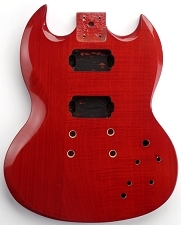 SG Body - SOLID Mahogany- Vintage Cherry- Bolt On - Free Rear Cover! Dual Pickup.